The C3 model to compete in the racing event has to be fully compliant with FIA WRC’s current regulations. That means that there probably won’t be a lot of changes except for WRC’s aerodynamics and engine requirements. Due to this, the concept car will look almost exactly the same as the C3’s final version. C3’s exterior has been designed for racing starting from the 55mm larger chassis all the way to the big bumpers, dual chrome chevrons and daytime running lights in LED. Citroen’s concept car is indeed ready for racing in colour yellow and carbon wing mirrors on both sides. The C3’s two-tone canopy also looks great with yellow borders and gel capsule, further highlighting its true racing spirit. Just to give more clues, the racing version will have the powerful 380bhp engine with a turbocharger flange now measuring 36mm in diameter. Meanwhile, the 1875mm enhanced width and the C3’s 25kg lighter body contribute to the car’s improved aerodynamics. Citroen will likely equip the racing version with an electronic differential control device since the WRC has already allowed the use of this feature. To add more “oomph” to the C3’s aerodynamics, it is possible that the large rear spoiler will be moved further towards the back. As part of the brand’s commitment to innovation and modern approach, Citroen will show a video of the C3 WRC concept car in motion. Produced by ScanLab Projects and Citroen, the black and white film is created with the latest 3D scanning technology. They even went all the way to Portugal and took shots of the video across Marao’s 25km racetrack last May. Undoubtedly, the company has prepared this artistic video in time for the 2016 Paris Motor Show. 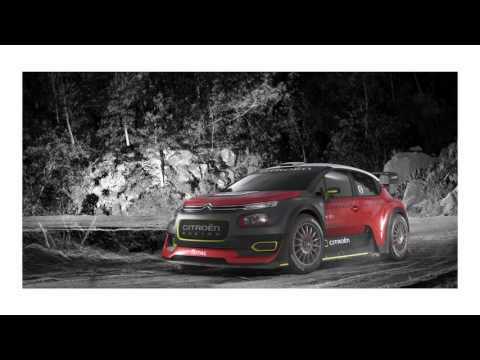 C3 WRC CONCEPT CAR: START YOUR ENGINES! Citroën Racing is getting ready for its big comeback to the FIA World Rally Championship, bringing with it a new challenge and adventure for a race team with renowned expertise. It is also an other way for the brand to support the launch of the New C3: an energetic car with a unique shape that packs a real punch under the bonnet. The world is getting an exclusive first look at the C3 WRC concept car at this year's Paris Motor Show. Designed by the Citroën style centre in partnership with Citroën Racing, the concept car offers and extreme vision of the C3, muscular and chiselled, with striking visual design. The concept car heralds the arrival of the race car that will compete for the first time at the Monte-Carlo Rally in January 2017. Already boasting three driver's world championship titles, Citroën is now on its way to winning its third manufacturer's title in as many shots at the FIA WTCC with the C-Elysée. The C-Elysée has encountered both sporting and commercial success in Citroën's major international markets. Today, Citroën is making another push in its product offensive with the New C3, and is getting ready to win a major championship: the FIA WRC. The Citroën team is already more than familiar with the WRC, having won 8 manufacturer's titles and boasting a record 96 wins. A competitive championship that is perfectly suited to the technical foundations of the New C3 and its energetic character. Very close the finalised car, the C3 WRC concept car hints at the intentions of the Citroën style centre without giving everything away about its final form. Based on the New C3, it retains all of its curves and fresh appeal. This ultra-sporty, brawny, and chiselled version incorporates the stylistic elements of the consumer version: a two-level illuminated logo, two-tone canopy and accents echoing the colours of the canopy. The exterior also stands out with a chassis 55mm larger than the New Citroën C3, affording greater aerodynamic freedom such as a spoiler for the front bumper. The C3 WRC's exterior has been adapted for the racing world with sober bumpers that accentuate the car's look, as do the dual chrome chevrons that extend down towards the LED daytime running lamps. The decorative touches have also been enhanced: the canopy is adorned with a gel capsule and a yellow border. As for the wing mirrors, they have been sculpted from carbon for a real racing look, and come in yellow to echo one of the colours available for the New Citroën C3. Enhanced engine power to around 380bhp, mad possible in particular by enlarging the diameter of the turbo flange to 36mm. Greater freedom with aerodynamics with a maximum width of 1875mm, a protruding front bumper and a rear bumper fitted with a diffuser. An enlarged rear spoiler moved further back for even greater aerodynamic support. The car is 25kg lighter. Committed to an innovative, avant-garde approach, the brand is also unveiling a video showing the C3 WRCconcept car in action. Shot especially for the Paris Motor Show 2016, the film was produced by Citroën and ScanLab Projects, a specialist in “3D scanning”: an innovative image processing technique using scans and data. The video was filmed in late May at the Portugal Rally, along 26km of the Marao course. Shot entirely in black and white, this artistic direction fits perfectly with the brand's desire to innovate. While you wait for the Monte Carlo Rally in January 2017, visit the Citroën stand in Hall 1, Aisle C, Stand 320!